Financial Metrics reveal characteristics of economic data sets that might not be apparent from a simple review of the numbers. Each financial metric sends a unique message about a body of economic data. However, each of these is also blind to many other aspects of the same dataset. The word metrics refers to measurement. Businesspeople speak of software performance metrics, customer satisfaction metrics, and financial metrics, for instance. "Metrics" in each case reveal—measure—specific characteristics of data sets: SW performance data, customer satisfaction data, or financial data. Most people in business—even outside of finance or accounting—have heard the term financial metrics. And, most are aware of examples such as return on investment or earnings per share. Not everyone understands the unique strengths and weaknesses of these metrics, however. And, not everyone appreciates their special data requirements. As a result, many businesspeople use financial metrics blindly, or in ways that signal misleading information. Each financial metric conveys a unique message about a body of economic data. In that way, financial metrics are like descriptive statistics. The statistical average (arithmetic mean), for instance, reveals the "typical" value in a data set. Similarly, each financial metric reveals specific characteristics of the economic dataset. Usually, those characteristics are not readily apparent when merely reviewing the data. Cash flow investment metrics, for instance, measure investment performance by evaluating the series of cash inflows and outflows that follow from the investment. 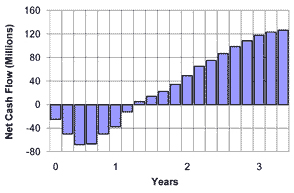 One of these metrics, the payback period, measures the time required for returns to cover costs. Potential investors can compare payback periods of different investments, to help decide which is the better investment. Prudent investors, however, will also analyze the same investment choices with other metrics besides payback period. Investors might, for instance, also use net present value (NPV), return on investment (ROI), and internal rate of return (IRR) to analyze the same investment choices. Each of these compares investment gains to investment costs in a different way and, as a result, each measures investment performance differently. Each metric also has its "blind spots"—insensitivities—to particular characteristics of the dataset. Consequently, decision-makers are always well advised not to base critical decisions on just one metric. Cash flow metrics help evaluate streams of cash flow events, such as investment outcomes or "business case" cash flow estimates. Familiar cash flow metrics include payback period, breakeven point, net present value (NPV), return on Investment (ROI), internal rate of return (IRR), and cumulative average growth rate (CAGR). Financial statement metrics, not surprisingly, are derived from financial statement figures. Business people use these metrics to evaluate a firm's financial position and financial performance. Well-known financial statement metrics include current ratio, inventory turns, the debt to equity ratio, and earnings per share. The article provides a high-level overview of both financial metrics families. Sections below introduce the essential members of each family, briefly, along with the metric's definition and purpose. The text also provides links to other Encyclopedia pages that explain, calculate, and interpret these metrics in depth. What is the role of cash flow metrics in finance, investing, and business analysis? What is the role of financial statement metrics (ratios) in finance, investing, and business analysis? Important financial statement metrics: Six metrics groups. Can the firm meet immediate spending needs? Does the company use resources efficiently? How do owners and creditors share risks and rewards? Is the firm earning acceptable margins? What are the firm's prospects for future earnings? Are revenues, profits, and market share growing? The Excel-based ebook Financial Metrics Pro is a comprehensive financial metrics handbook, textbook, and template library. The Excel-based ebook Financial Modeling Pro explains and illustrates the role of financial metrics in financial modeling. Cash flow metrics describe cash flow events in various ways. They may apply to a single transaction, such as an incoming cash payment coming sometime in the future. And, they may refer to a series of cash flow events that follow over time from an investment or action. Exhibit 1 pictures such a "series"—a cash flow stream—ready for analysis. Exhibit 1. Most cash flow metrics derive directly from net cash flow figures such as those in the graph. The profile in Exhibit 1 is a typical investment curve. This term refers to cash flow streams with earlier cash flows that are substantially negative, and later cash flows mostly positive. A firm expects a specific cash inflow five years from now. Management may ask: What is the value of that future inflow today? Consequently, the present value metric provides one answer. An investor buys a bond, causing cash outflow from the investor's bank account. The bondholder then receives regular interest payments for the rest of the bond's life. Years later, at maturity, the investor receives a significant cash inflow. How does a potential investor compare one such investment possibility with another? Here, the yield to maturity and return on investment metrics provide a basis for such comparisons. A business analyst projects a cash flow stream from an action, such as a five-year marketing campaign. And, the act brings a series of cash inflows and outflows over the years. Exhibit 1 above could represent these inflows and outflows. How do analysts compare the financial outcomes of this action to the likely results of other acts? Cash flow metrics such as net present value and internal rate of return help make such comparisons. These uses are helpful for budgeting, planning, or decision support purposes. For a multi-period cash flow stream, the analyst will normally calculate a net cash flow figure for each period, as well as the total net cash flow for the entire cash flow stream. An investment that results in positive net cash flow may be considered a net gain. An investment resulting in a negative net cash flow is a net loss. Net cash flow figures do not take into account the time value of money (discounting). Net cash flow is thus insensitive to the timing of inflows and outflows within the period. A net cash flow figure itself does not reveal the magnitude of total inflows or total outflows. Net cash flow shows only the difference between these totals. At the end of the final period, cumulative cash flow must equal total net cash flow for the entire cash flow stream. Analysts usually calculate "Cumulative cash flow" without considering the time value of money (discounting). Future value (FV) is thus the value funds will have at some time in the future when they are flow in or flow out. FV in this way contrasts with the Present value metric (next section) which is instead the value today of funds to receive or pay at a future time. The PV today ($711) is thus discounted below the FV ($1,000) of funds to be received or paid in the future. Note that the sum of present values for a multi-period cash flow stream is a financial metric in its own right, known as net present value NPV. The magnitude of the discounting effect for each PV depends on (1) an arbitrarily selected interest (discount) rate, and (2) the number of discounting periods between now and the future cash flow. The higher the discount rate, the higher the discounting effect. The higher the number of discounting periods between now and actual cash flow, the higher the discounting effect. How long will it take for an investment to pay for itself? How long before "cumulative gains" exceed "cumulative costs?" A shorter payback period means that investors recover investment costs sooner, and the funds are available again for further use. Analysts see the shorter payback period as less risky than a more extended payback period. Return on Investment ROI is a favorite financial metric for evaluating the economic consequences of investments and actions. Several "metrics" carry that name, but the best known is the metric appearing in this encyclopedia as simple ROI. Simple ROI compares returns to costs by making a ratio between cash inflows and outflows that follow from the investment. By definition, the ROI ratio calculates as net investment gains divided by total investment costs. Simple ROI in this form is legitimately called a measure of profitability. Analysts usually present the ROI ratio as a percentage. When the metric calculates as ROI = 0.24, for instance, the analyst reports ROI = 24.0%. The opposite kind of result, a negative ROI such as –12.7%, means that costs outweigh returns. Analysts, in that case, view the investment as a net loss. Consequently, when comparing two or more investments—and when risks and other factors are equal—analysts consider the investment with the higher ROI to be the better choice. Many businesspeople outside of finance have heard of IRR, probably because their financial officers often require an IRR estimate to support budget requests or action proposals. Some organizations define a hurdle rate as a specific IRR rate. They specify, that is, an IRR rate that incoming proposals must reach or exceed o qualify for approval and funding. An IRR rate higher than the firm's cost of capital (or opportunity cost for using funds) usually means the investment should be considered a net gain. Other factors being equal, the investment with the higher IRR is considered a better investment. Further interpretation of IRR magnitudes, however, depends on (1) the firm's cost of capital, (2) the return rate the firm can earn on other invested funds, and (3) ongoing trends in rate changes. Analysts usually describe the break-even point as a particular number of product units a firm sell at a given price for total cash outflows to equal total cash inflows. Units sold over the break-even number represent a net gain or positive margin. P = Selling price (or Cash inflow) per unit. v = Variable cost (the Cost added for each unit sold). F = Overall fixed cost. For many firms, understanding how selling price, variable cost, and fixed cost impact break-even volume is crucial in budgeting, production planning, and profit forecasting. Total Cost of Ownership TCO analysis attempts to uncover all the lifetime costs that follow from acquiring and owning certain assets. Not surprisingly, TCO has the name "asset life-cycle cost." Asset ownership brings purchase costs, of course, but "ownership" also brings costs due to installing, deploying, using, upgrading, maintaining, and disposing of the same assets. These after-purchase costs can be substantial. Consequently, for many kinds of assets, TCO analysis finds a significant difference between purchase price and total life-cycle costs. TCO requires the analyst to develop a comprehensive cost model—a model that identifies all the obvious costs of ownership, but also all important costs sometimes called "hidden costs." TCO results are especially useful when the analyst populates the TCO cost model with actual cost components—showing the contribution of each component to overall TCO. Most profit-making companies are expected to grow over time—"growing" sales, profits, and shareholder value. Consequently, owners, managers, directors, employees, competitors, and industry analysts all take a keen interest in tracking business growth metrics for the company. First-year sales revenues (PV) of $1,000,000. This company's annual average growth rate compares, of course, to industry averages and to competitor growth rates. Exhibit 2. Financial statement metrics (ratios) derive from numbers on the Income Statement, Balance Sheet, Statement of Changes in Financial Position, and Statement of Retained Earnings. Investors considering buying or selling stock or bonds in a company. Company management, for identifying strengths, weaknesses, and target levels for business objectives. Can the company meet its short-term financial obligations? This encyclopedia defines, explains, and calculates the following liquidity metrics. Does the firm earn acceptable returns from its assets? This encyclopedia defines, explains, and calculates the following activity and efficiency metrics. How do owners and creditors share business risks and rewards? This encyclopedia defines, explains, and calculates the following leverage metrics. Does the firm make good use of its assets? This encyclopedia defines, explains, and calculates the following profitability metrics. This encyclopedia defines, explains, and calculates the following valuation metrics. How does the company's recent growth compare to similar companies? How does the firm's historical growth compare to industry averages?